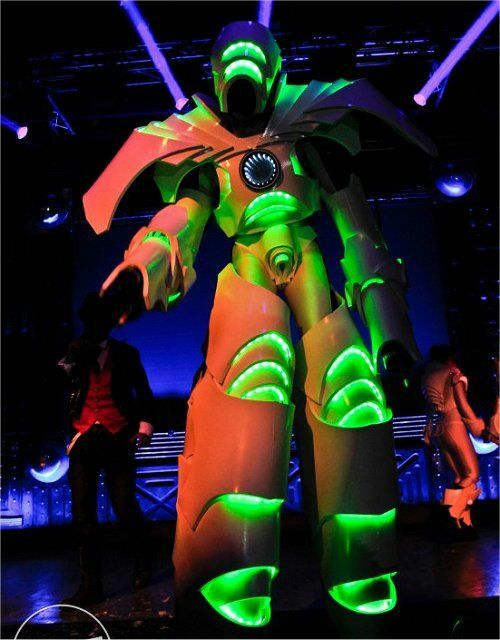 iGlowbot is a super bright LED-clad giant robot, perfect for corporate events. This robot utilises full RGB LED and a full arsenal of SFX in a package that moves the whole LED robot idea up another level. This is something shiny and new – pure geek chic. 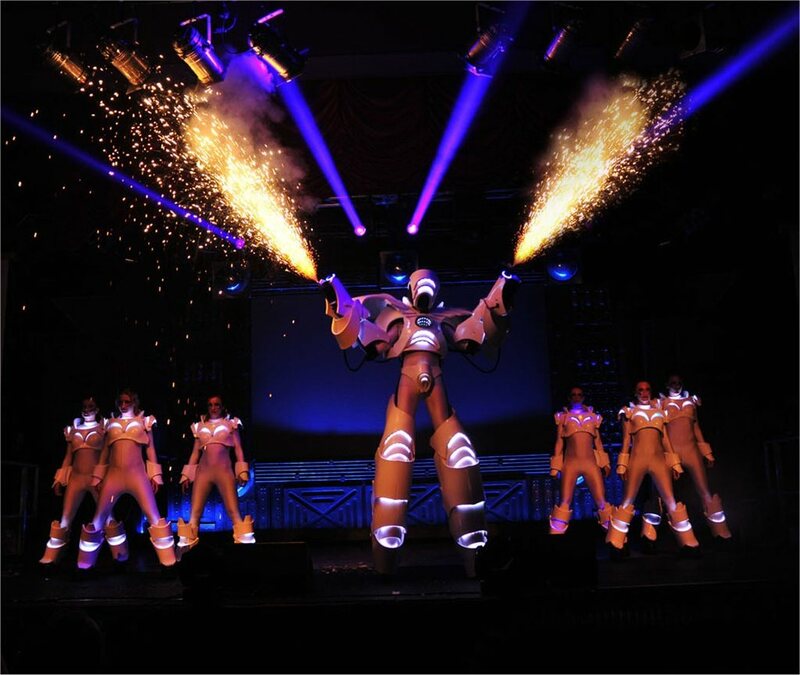 Features include shoulder mounted blue lasers and is fully kitted out with dual controllable co2 cannons and a remote controlled pyrotechnics system. An infinity mirror chest piece runs through the centre of the robot. 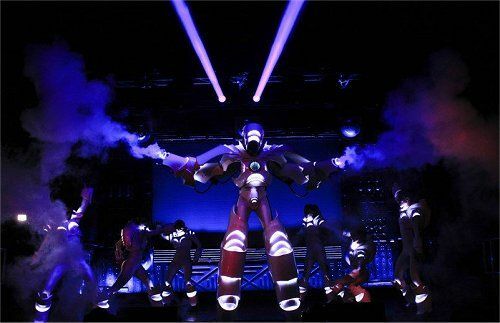 The RGB LED lighting offers unprecedented control via a system that allows synchronisation between iGlowbot and other performers – or any suitably equipped room decor. The iGlowbot made its debut at the Sci Fi Weekender this year to a rapturous reception. Of course, an electrifying army of iGlowGirls followed in suit with a brand new routine. These are also available to hire. 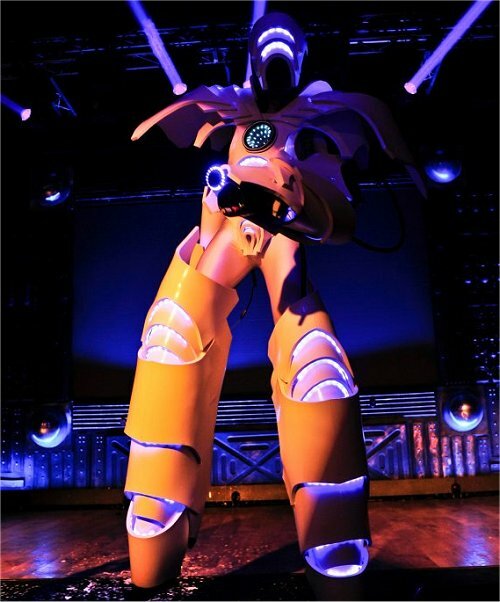 Simply put, its the most advanced and refined performing LED robot in the world. The iGlowbot performs 3 x 20 minute sets. Feedback is great from the weekend – everyone was really happy with how the shows went. The guys were great to work with, really helpful with the filming as well. Thank you so much for all your support across these Battle of the Club events. They were great! Bang on time and really good to work with. This was a difficult gig as it was a grime night and so not that suited to Glowbot but the crowd enjoyed it and they did a 5 min stage show and 5 min walk around. The client was really happy with how it all went. Glowbot was outstanding. Thank you so much. We will work with you again soon. Maybe you can start to have a think about next performers for our next event! Keith and Spike were excellent on Friday in Liverpool! Really cool guys, the performance was great – Keith used a more ‘robotic’ style than I’ve seen before – looked amazing and the crowd loved it. We did a walk about as well and got some great pictures!